Fishing Red Fish Nawlins Style. What does that mean ? A customer asked recently. I have one of the best jobs in the world and live in one of the best cities in the country. This city is full of life, excitement, action, fun ,southern hospitality,and the list goes on and on. My charters are exactly that as well . Action packed , lots of fun and excitement with southern hospitality. 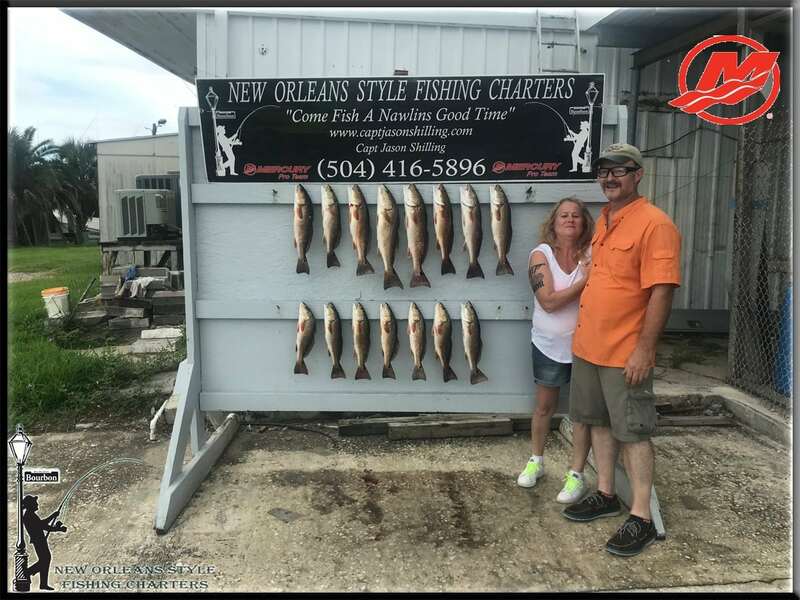 I strive to make my fishing charters the most memorable experience of your stay here in New Orleans. If it isn’t then I haven’t done my job. I want you to come as strangers and leave as friends with memories of … “Catching Fish Nawlins Style “. We’ve been mostly fishing red fish the last couple weeks . The trout are still out there ,but there’s nothing like hearing the drag scream as a big red is making a run. We are mainly fishing the back waters of New Orleans in less than 5′ of water. Fishing with weedless spoons and artificial swim baits . At times I’ve fished with some shrimp under a popping cork and has been effective as well. The weather has been beautiful with temps in the mid to upper 70’s and a light breeze. We had a pretty good cold front blow through last week . Which stirred some things up a little and dropped the water level a bit but we managed to stay on the fish and send everyone home happy . Business has be great with us booking lots of trips and making memories for all who come fish a Nawlins good time. I want to thank every one for coming out fishing with New Orleans Style Fishing Charters. It’s my pleasure to have y’all out fishing with me and look forward to seeing everyone again soon.